Front Royal (declared by the Governor to be the Canoe Capital of Virginia) has been a gateway to exploring western Virginia for over three hundred years. Its location at the confluence of the North and South Forks of the Shenandoah River between the Blue Ridge and Massanutten Mountains leads the visitor to some of the finest habitats Virginia has to offer. To the north, mighty sycamores and numerous small streams that flow into the mighty Shenandoah River divide fields farmed for centuries. 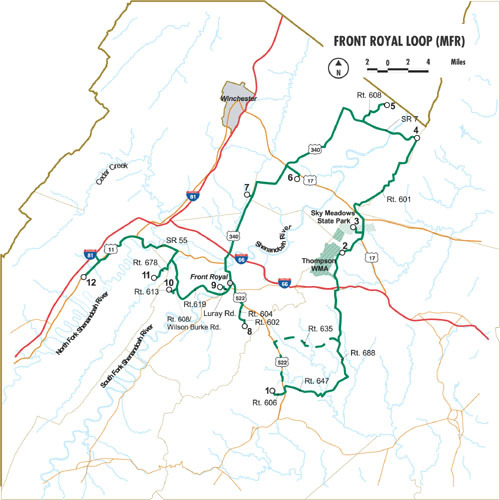 The Shenandoah winds through the Town of Front Royal from points further south, carving a valley between the Blue Ridge and the 40-mile long Massanutten Mountain. Follow the numerous trails that lead from the Shenandoah Valley to the lower slopes of these impressive mountains. Best experienced by canoe, kayak, or raft, the Shenandoah River offers a refreshing retreat from the summer sun and as the days grow colder, the river becomes a haven for waterfowl. At the valley’s edge where the woods intrude on the fields, ruffed grouse, wild turkeys and white-tailed deer forage and raise their young. Climbing the slopes in spring will lead to an ever-changing assemblage of warblers and culminate in incredible vistas from West Virginia to the Atlantic Ocean. In the fall, these mighty ridges lead thousands of birds of prey south to their wintering grounds and will surely lead the visitor to additional memorable experiences.